Chocolate Mist Hemp Baby Sling Discounts Apply ! 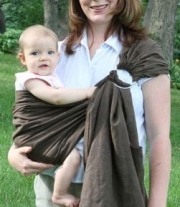 The Chocolate Mist Baby Sling is a wonderful way to snuggle with your baby, from preemie size up to 35 lbs. The toxin-free, 55% Hemp and 45% Tencel material is snuggly-comfortable for both baby and mom. Safe and secure, baby slings are a great way to bond with baby.